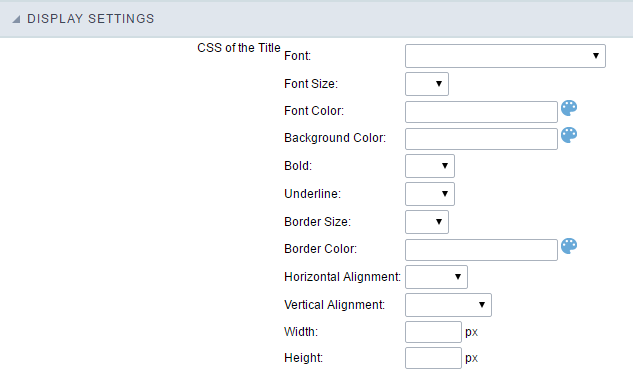 HTML Editor field configuration Interface. Data Type : Define the type of field for the application. When set to HTML Editor, you can inform any type of character and they will be saved in HTML form. Height : Inform the Height in pixels for the HTML Editor. 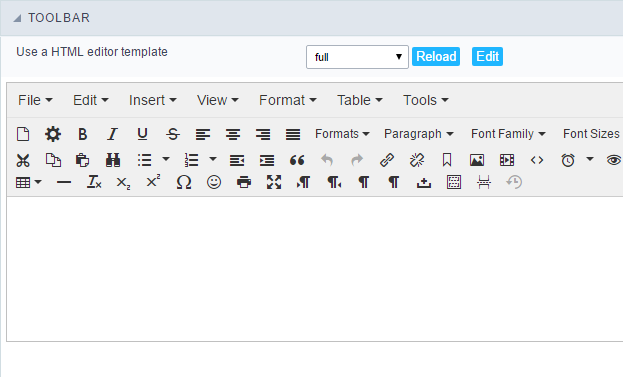 HTML Editor toolbar settings Interface. Status : Status Bar Display (Do not Display, Top and Bottom). Amount : The Amount of lines of the HTML Editor toolbar. Button Organization : Allows to position the toolbar buttons. Preview : You can visualize the toolbar according to the previous settings. Allows to define a value to be saved to the database. Defined Value : Allows to specify the fixed value associated to global variables. Auto Increment (automatic) : Allows to use the increment generated by the database. Used only when the field of the database is the type AUTO INCREMENT or similar. For the databases that use sequence like Oracle, PostGres and Firebird, it is necessary to inform the name of the sequence. Auto Increment (manual) : The application generated simulates an auto increment on the field. To include a value to the field it will automatically calculate the next id. Date of Insertion : When inserting a record, the field will contain the server date as a value. Data of Update : When updating a record, the value of the field will be the date of the server. User IP : The field will receive the IP of the machine that the application is be accessed by. Calculated by the database : The value of the field will be applied by the database. The field will not be used in update processes. For example: it will be updated by a Trigger. Null : The field will be informed the value null.